This article received a DWAA nomination, February 2013! There are more tips than this, but these are the Top 10 that have come up over the past nine years, working with almost 400 puppies each year. A helpful reminder to puppy owner’s who want to grow their puppy into a balanced and loving adult dog. Whether you’re goal is competition, hiking, awesome family pet, or beyond. Handle your puppy with safe and trusting human hands. Prepare your puppy for handling of the body, ears, back, belly, and paws. Pick your puppy up from time to time during the day and give them small treats or a nice kiss and then put them down. Holding should be a positive experience. Massaging puppies right before they drift off to sleep is a great way to make touch a positive thing! Socialize your puppy kindly and considerately. NOTE – you are their voice in the human world, you always choose their environments. When taking your new puppy out and about, introduce them to people (children, men, women, elderly…), places, things, events and other well socialized appropriate dogs (always ask, “is your dog friendly with puppies”). Socialization starts the day you bring your puppy home, not when they are done with their vaccination schedule. Invite puppies over to your home that are in your training classes and have play dates on a regular basis. Have a managed and structured environment. When you have a routine for your puppy, you eliminate much of the guess work. Potty, feed breakfast while working on play with a purpose or specific behaviors, potty again, possible short walk or socialization outing, potty again, and then crate or have your puppy in a gated managed space for a nice long nap. Repeat throughout the day. All Food and Rewards should be healthy choices. Saving your left over meat in little baggies and freezing is the Best training reward you can offer. Water should be available from the time your puppy wakes up until they go to bed at night. Not necessarily in their crate during nap times, but anytime they are active and moving about. A dehydrated puppy is not a place you want to visit. If your puppy is thirsty, believe them! Have items available on the floor at all times for teething puppies. VIDEO. If your puppy grabs onto your hand, exchange with a bully stick or raw bone. Always exchange, even if it feels like you’ve done it for the bazillionth time. Be honest in the fact that your puppy is loosing, pushing and setting teeth until 13 months or so. Always give their mouth a job for a successful teething season! Always carry rewards in your pocket, always! Because you live with your puppy you are in fact training and teaching 24/7. Everything you do in your home or yard teaches your puppy something new about their life with you. If you see your puppy offer a behavior that you like and want to keep, please reward it. You are giving your puppy awesome information this way! This is not active training, but more life skills teaching. When actively training new behaviors make sure you have a plan. Take a class or read up on, getting a behavior + marking a behavior + rewarding a behavior. That pattern will take you from the basics all the way to pushing a ball across a field. Be a good consistent teacher. Playing and interacting with your puppy is vital in growing a socially and emotionally balanced dog. Playing together with toys, hide n seek, recall games, find it, etc. Play with a Purpose is the foundation for structured play, building team, trust, and a great relationship. Puppies should bring out your creative side! Crate or a fenced manged space is very important for a successful household. It eliminates so much conflict and stress with an active puppy, helps with house training, and keeps puppies successful in a human environment. These managed spaces should be used after you have met your puppies needs (please refer to #3), for down time, or managed time while you are away. In general, a puppy should never be crated more than 3 1/2 to 4 hours at a time. Their crate should be in a space where they feel safe, isn’t to cold or hot, and where they enjoy just hanging out. The families bedroom tends to be that space more times than not. Love your puppy. Let them know how much you love them. Talk to your puppy, touch your puppy, lay down and cuddle on the floor together. Bonding is a large part of a healthy trusting relationship. 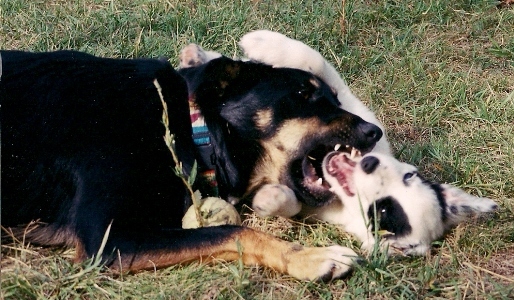 Rough housing, while fun in the moment, teaches puppies that human hands can’t always be trusted. You are also encouraging inappropriate play with will eventually get you a small ding on your hand or face, and your puppy a good correction. Don’t take a young puppy to a dog park, this is for health and safety reasons. Don’t get busy with your day and let your puppy guess what their job is with you. If you give a puppy lots of freedom without supervision they will fail and then you will correct them. Don’t give junky food to your puppy. No corn, wheat, soy, sugar or food dyes. Read the labels. Don’t restrict water, ever! Don’t ever grab your puppies mouth and hold it shut and scream NO BITE. Frankly this creeps me out, but it’s just poor handling and will clarify to your puppy that you cannot be trusted. Puppies need to explore with their paws and jaws, it’s up to the handler to provide the appropriate management and items to chew on besides human body parts. Some puppies are more mouthy and grippy than others, in those instances, you will need to be even more vigilant to management and giving your puppies mouth a job with items to chew on. Don’t ignore behaviors that your puppy offers just because you are not in an active training session. Being a good observer is part of being a good puppy owner. Don’t demand that your puppy obey your commands, again so creepy. Your puppy is not a minion, robot or thoughtless piece of property. Most puppies that have crossed my path can out reason most people I know. Know the behaviors that will be important in your household and beyond, and make a plan to teach them in a positive way. Don’t put your puppy in the back yard to entertain themselves while you go about your day. You will teach your puppy that they are on their own and the relationship will not be a strong one. You will also get one if not all of the following; barking, fence running, property guarding, and/or digging. Don’t leave a puppy unattended in the home while you are working in another room or when you go out. Puppies will make puppy choices and they are generally destructive. Manage first so you don’t fall into correcting later. Don’t use a crate for extended periods of time with a puppy, or as a place of punishment. Don’t withhold affection or love. To be an authoritarian, bossy and/or domineering will ding your relationship with your puppy. I have never seen an emotionally or socially balanced puppy who grew up in this type of environment. There is no healthy relationship I know of where one living being dominates over the other living being and it’s good to go! Not just for puppies anymore and most of those things I think should go on for the life of your dog! 🙂 My only other addition is #10, #10, #10 FOREVER!!! Thanks for this post, I need it right now with my new addition!